Recently made up a VERY quick and easy project for Janome America which is free for you to use… a felt apple pin for your favorite teacher. Of course you could also make it in woven cloth, a lovely wool, anything you like, but a wool felt is fast, Fast, FAST…and fun! I used leftover bits of felt–you could use black for the backing instead of the oatmeal felt I had, anything you want! 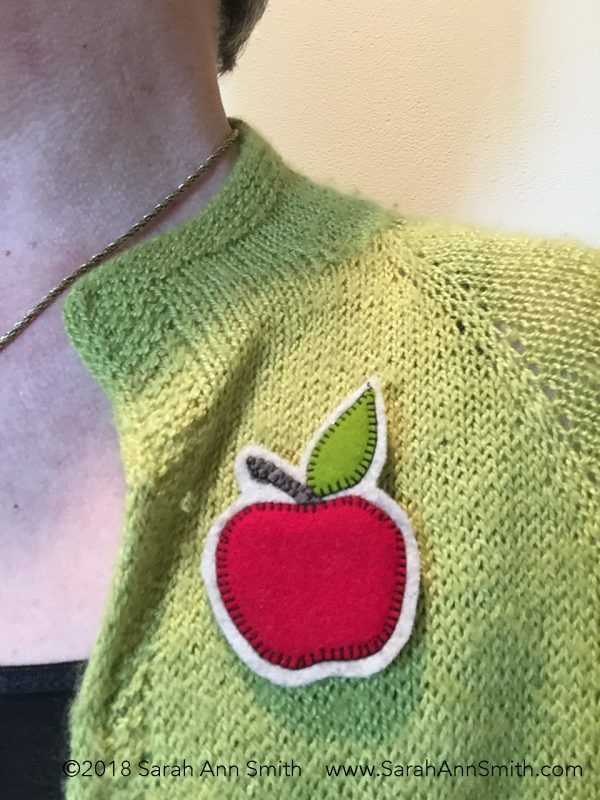 Including drafting the apple and sewing on the pin backing I think this took all of an hour to make. 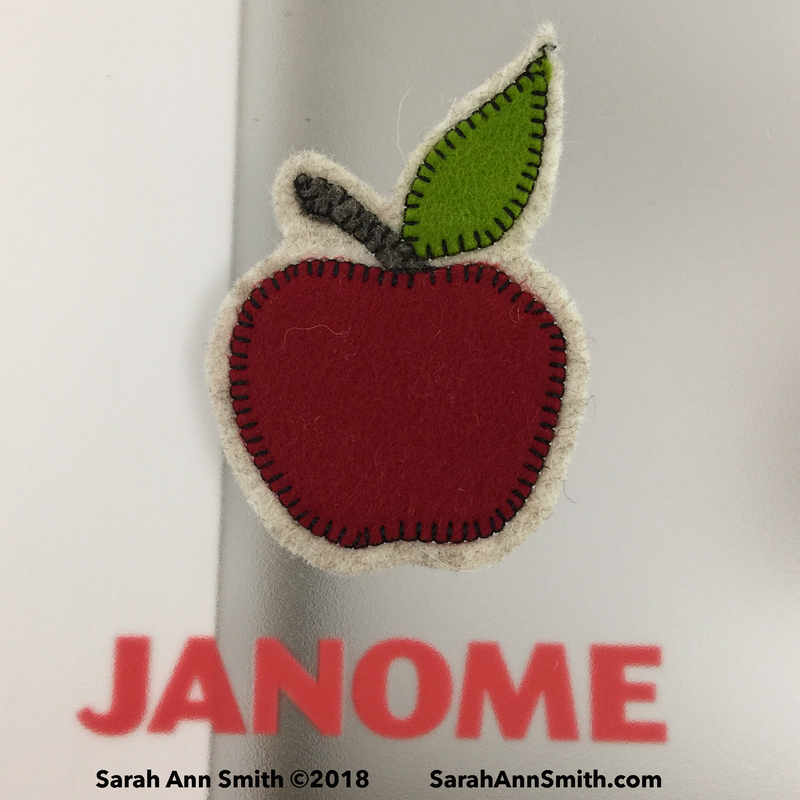 The blanket/buttonhole appliqué stitch on my Janome 9400 make this quick and easy. To find full instructions with more pictures, details and tips, visit the Janome blogpost for this project, here. Thanks as always to Janome America for their support. 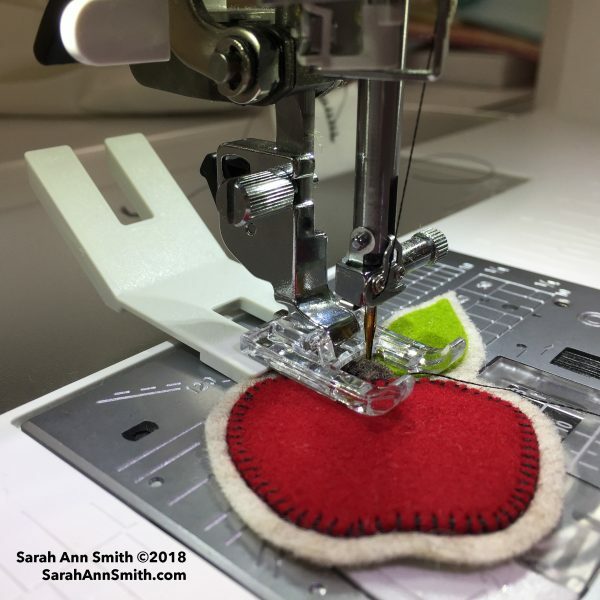 I’ve sewn on Janome machines for 15 years now, and they are the best. Currently I’m using the 9400 and it is my dream machine! Ever so slightly ahead of schedule, I have begun quilting on the Lupines. Luckily (and one reason I chose this imagery) this will be easy quilting. And yes, once again, I LOVE MY BERNINA Q20. Crazy expensive and worth Every. Single. Penny. Lots and LOTS of pennies. 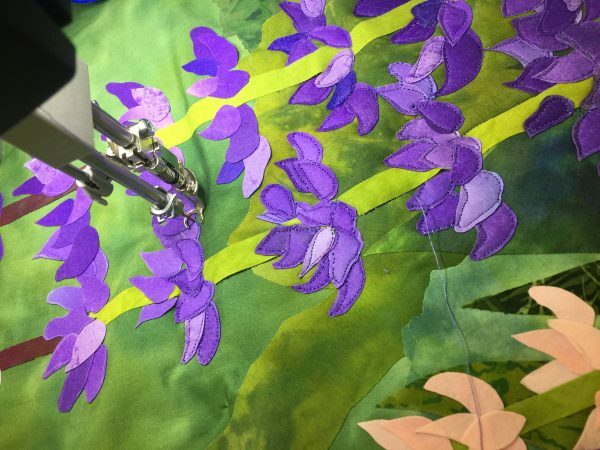 This morning I finished basting the Lupines quilt. I decided to try something I haven’t done before: a double batt. I definitely wanted to use wool, but I haven’t been able to find a source for my favorite Matilda’s Own Wool-poly blend batt in the US recently, and I’m hoarding my last batt. So I used Quilters’ Dream Wool which is much fluffier; I fused my top to that. BUT I was concerned about distortion because of the fluffiness–it just didn’t feel like it would hang well and be stable. Dreamy (pun intended) in a bed, lap or snuggle quilt, but by itself on a densely quilted wall quilt? Not so much. So I took the only cotton batting I had, Quilters Dream Select, and layered that underneath the wool. If I had had Request, the thinnest, I would have used that instead. Finally, spray basted the backing and safety pinned intermittently. 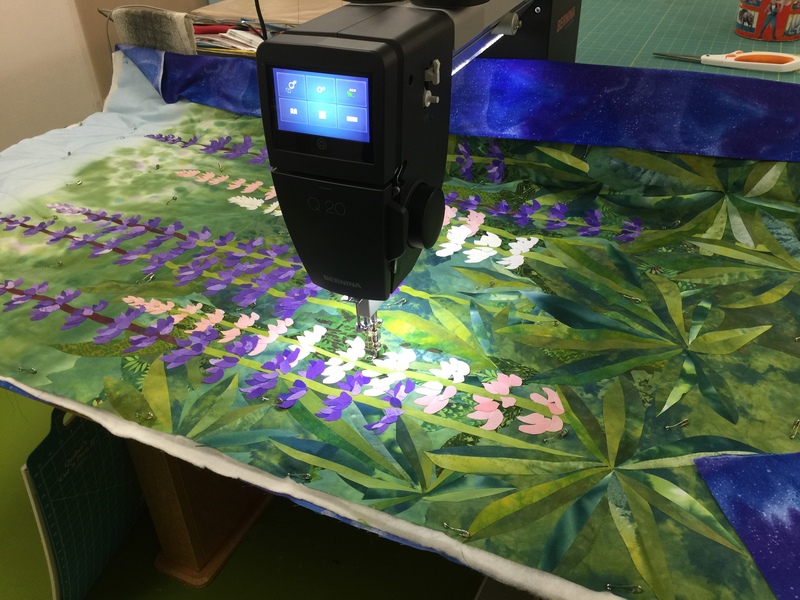 I am using up long lengths of print fabric in my stash when they suit the quilt–time to move them along. Will have to dye something to match for facings and hanging sleeve. 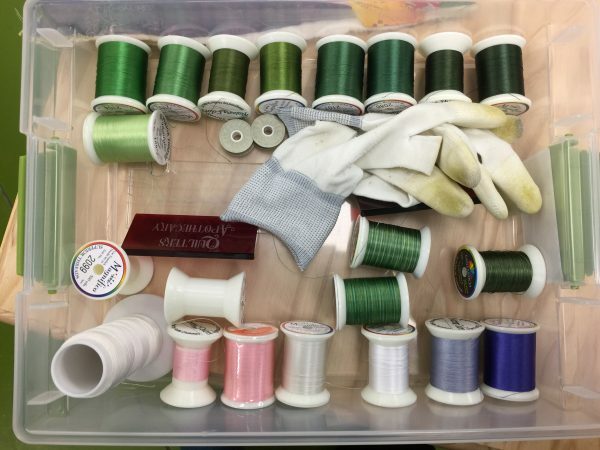 I also selected thread yesterday afternoon and this morning. When I choose thread for a quilt, I “test drive” it by drizzling on the surface. If it works, it goes in the shallow box. I probably won’t use all of these, but will use most of them–about half the solid greens and almost all of the rest. And I added a medium purple this morning and will likely not use the dark purple in the box at all. Painting a nonwoven is a good thing. But if that nonwoven is Pellon 65 heavyweight interfacing, it is somewhat like using construction paper. Will do the non woven thing again, but will look for something softer yet still dense (so no shadow through). Mistyfuse is by far my fusible of choice. But it behaves differently on the interfacing than it does on cloth. If I fuse this particular interfacing again, I will use TWO layers of Mistyfuse–it is plenty fine and easy to stitch, and it will help this painted interfacing stick better–see photo. Because of the difference (in porosity maybe?) between fabric and interfacing, my fusible isn’t sticking quite as well as usual. So I have re-fused various spots, and in a couple of cases tucked snippets of Mistyfuse under the stubborn lifting petals. I found, luckily, that if I am careful I can still quilt those lifting petals because the interfacing doesn’t wobble around like fabric. And to my astonishment, I quilted almost five of the six purple lupines today. I have a couple of the tops where I will use pale lilac or cream unstitched as of this evening, but I am definitely farther along than I thought I would be. Quilting in progress…done on the right, not done on the left. Using just one purple thread to stitch down the petals/quilt down the petals is working out OK despite the value changes from petal to petal. That means the “after Eli goes back to college” period may be less frantic than I had feared. YIPPEE! Barring catastrophe, I will be one and able to take photos and submit then ON TIME. Stay tuned! 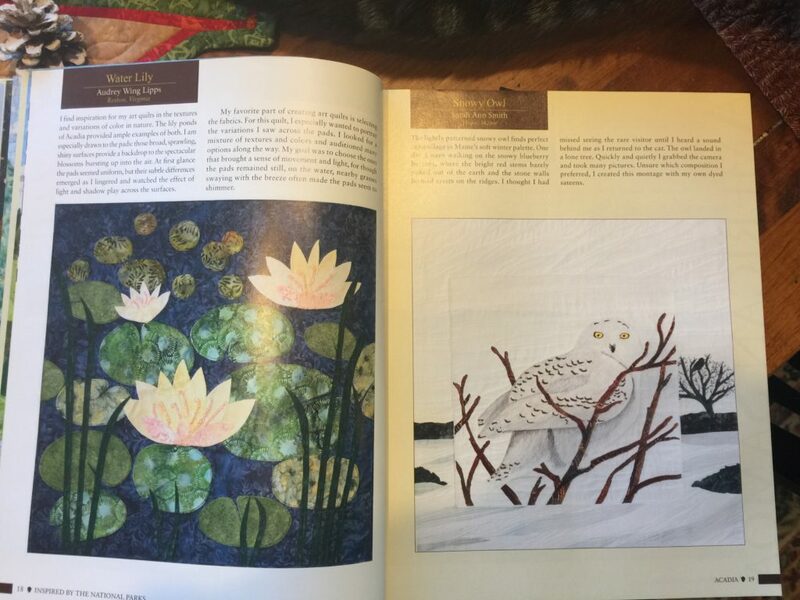 Before I moved to Maine, I met Maine quilter Sally Field via the QuiltArt online quilt list; in fact, she is one of the ways we found our way to the Camden and Hope area! After moving here, she kept telling me about her friend Dianne Hire, who lived maybe half an hour north of me. Dianne’s Scrolls, on the right, is the quilt I began on this life-changing weekend. Dianne Hire’s Yellow FraShizzle is on the left, and I have to giggle–I have that same plaid fabric! The book is APP-2-Applique, available here. Just keep reading! The second year (or thereabouts–circa 2006) that we were here in Maine, Dianne was scheduled to teach at Paul Smith’s Quilt Camp in the Adirondacks (New York). Alas, she injured her back–badly–just a couple days before. She didn’t want to cancel on the venue and students, but she was on serious pain meds and couldn’t drive. The quilters network went into overdrive, and to make a hectic 36 hours short, I ended up being able to take a week away from family, drive her to the camp, help her with the heavy lifting and schlepping of stuff (all quilt teachers know how much heavy lifting, literally, is involved!) and in exchange, get to take her classes and stay for free. I met Dianne, then, for the first time as I went to pick her up to head out to camp. That weekend was to become life-changing for me: for the first time, I was on the teacher’s site of a retreat. I met other quilt teachers and realized hey! I teach locally now, I can do this. That weekend is what led to me becoming a national level quilting teacher. 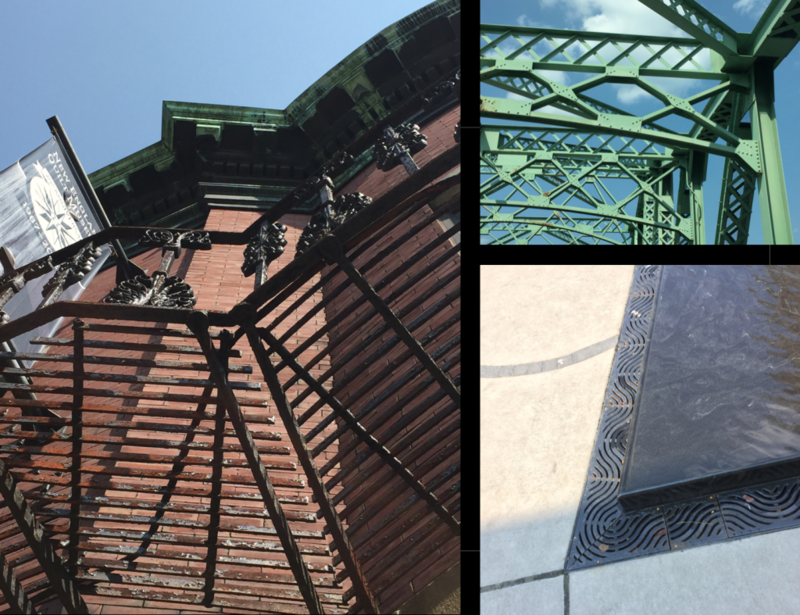 I had never thought of that, but this weekend opened my eyes, I saw a doorway, and off I went! 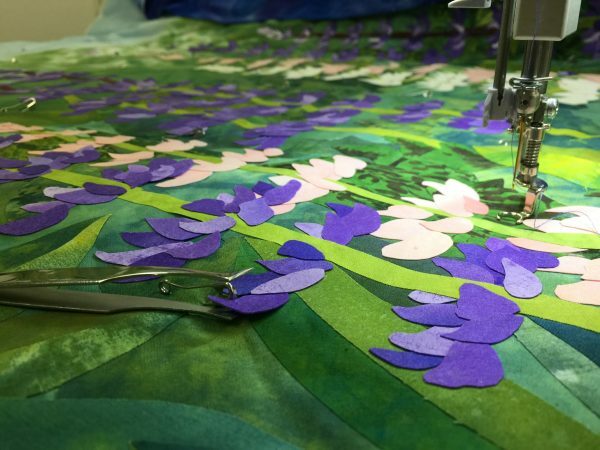 Fast forward many years: Dianne’s APP is for Applique became a quilter’s favorite. But she had (of course she did!) more ideas than could fit in one book. After life happening (including back surgery) for her, she finally got to put more ideas into APP-2-Applique. 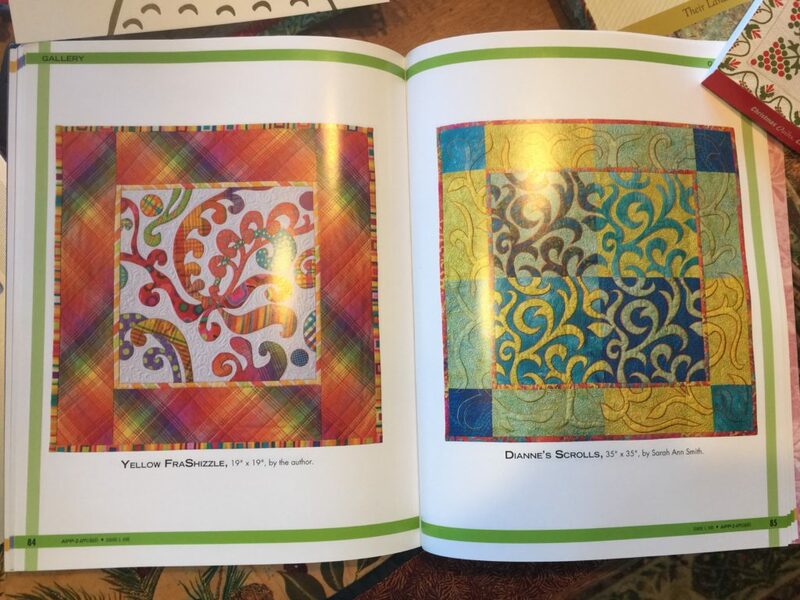 The book is so much fun–not only does it have great patterns, quilts by my local peeps (who are of course HER local peeps too), but it teaches you how to make your own designs, too. Way cool! 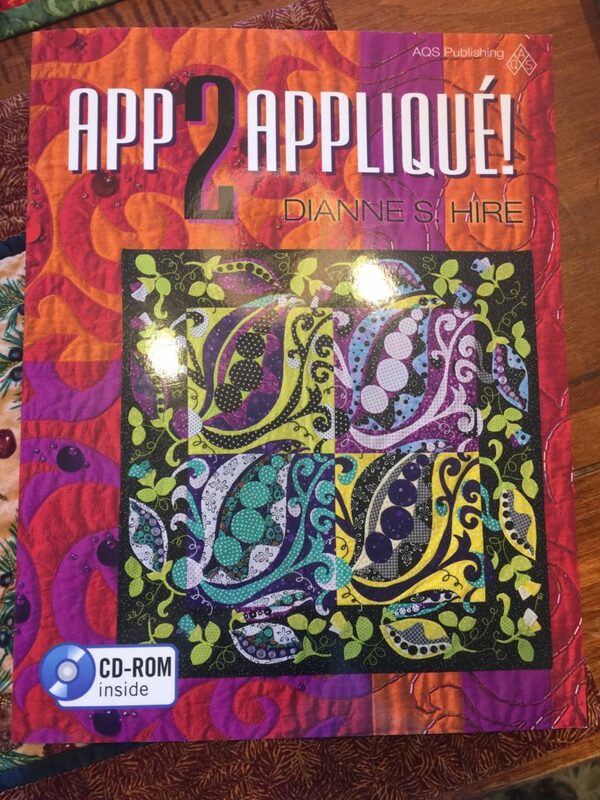 APP 2 Applique by Dianne S. Hire–use the patterns or learn to design your own. Dianne’s first class that weekend was the designs that became this book, and I was having so much fun, I just kept working on my quilt in her next classes. And I have to say, it is a testament to Dianne’s goodness that despite the incredible pain (even with major pain killers) that she was unfailingly polite, gracious and kind to one and all that weekend. Utterly amazing! In the section on the Scrolls pattern, Dianne talks about selecting fabrics to make the scrollwork pop, how to prepare the pattern to get two blocks for the effort of one, and more. 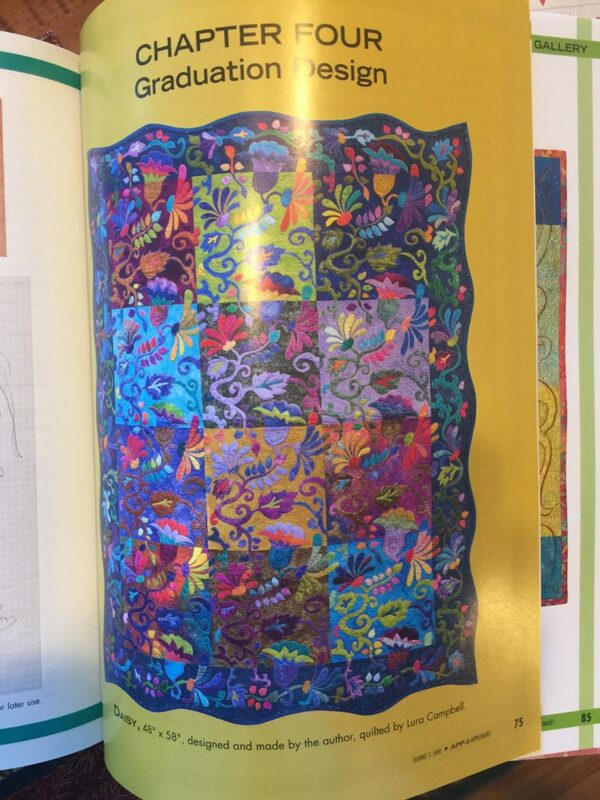 And Dianne includes quilts by others to give you an idea of the many ways this design can be interpreted. 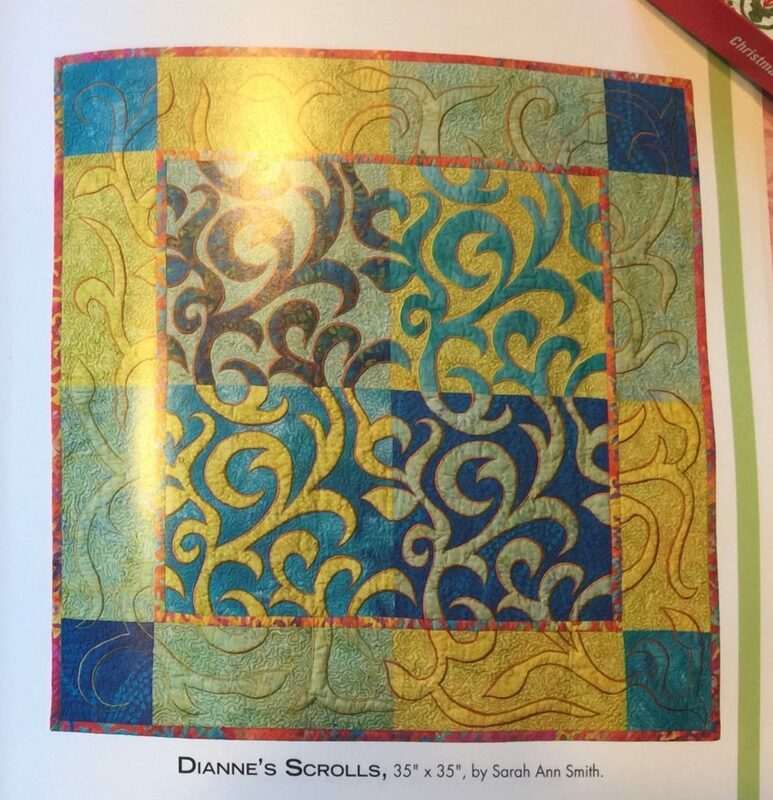 One of my favorite of Dianne’s quilts in this book is this colorful beauty! Diane’s work is full of joyful color. 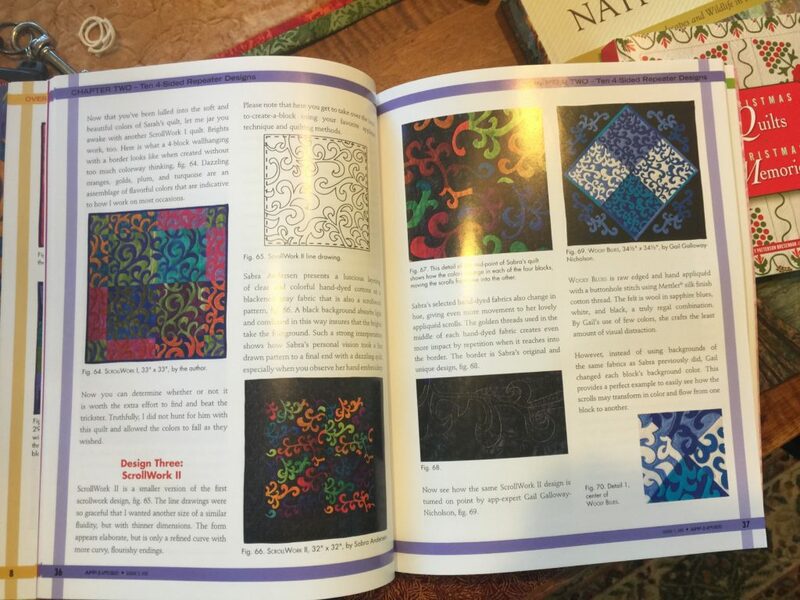 So I thank Dianne, for her friendship, for including my quilts in her books, for teaching, for showing me the way. When the books arrived at her house, she called us all up and we ended up (a bunch of us published in the book) going to Dianne’s house for tea and signing the books–like autographing yearbooks. I treasure being in this book with my friends! Thank you, Dianne, for all you have done for me and shared with me. Dianne’s Scrolls © Sarah Ann Smith. Published in APP-2-Applique by Dianne Hire. 2016 was a very good year for me, including being published in books and magazines. It was also a very hectic year and I have neglected my blog and sharing my news, so I’m going to get caught up this week and next, at least on the published works. One of the delights of the year was FINALLY being able to share a small quilt I made some time ago for an exhibit and book to celebrate the centennial of the founding of the US National Parks, website here. 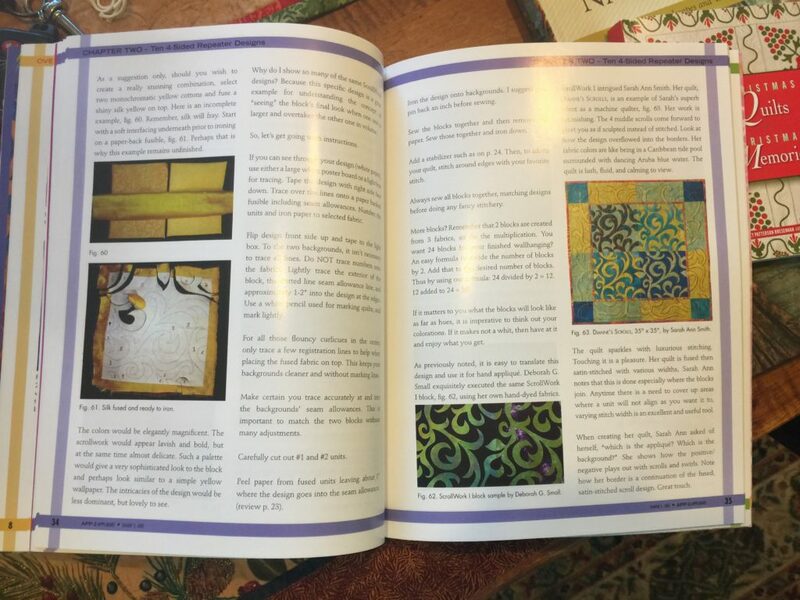 Part of the exhibit debuted at International Quilt Festival in late 2015, but the book was not released until Spring 2016, so we were asked not to share photos online. For once, since my contribution was for Acadia National Park, I was not alphabetically challenged (with a name like Sarah Smith, I’m at the end no matter whether lists are done by first or last name). 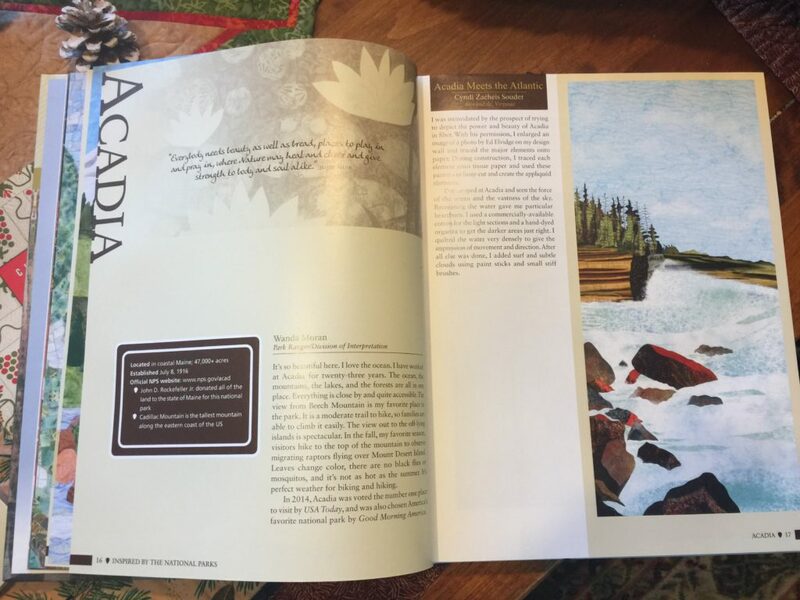 Inspired by the National Parks, by Donna M. DeSoto. You can visit the exhibit website here and purchase the book here. 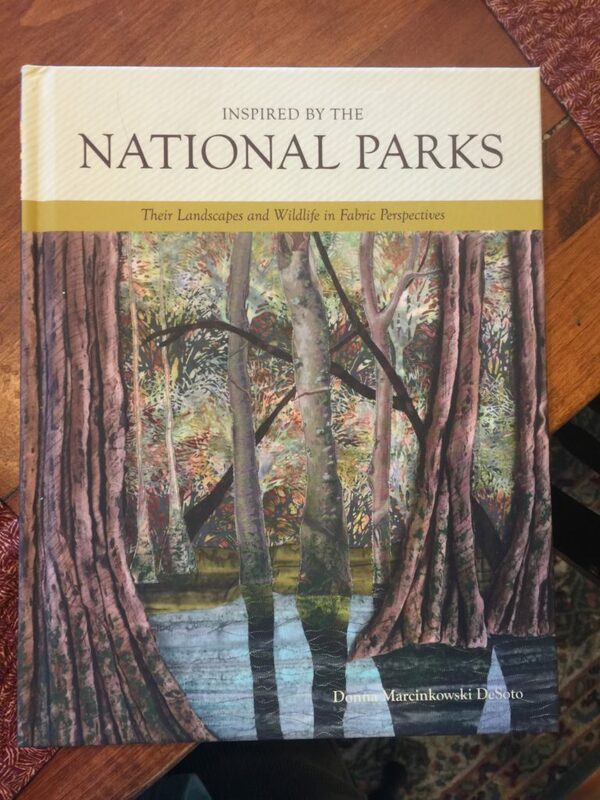 In the book, Donna has contributions from one of the US Park Rangers working at each of the national parks, writing about the park, along with tidbits of information about each place. 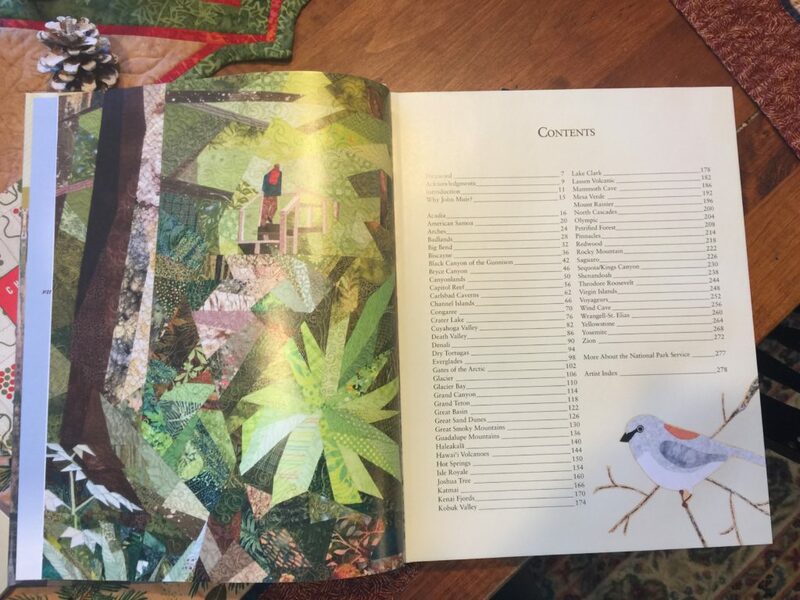 Acadia National Park, opening pages with statement from a park ranger and the landscape quilt, by Cyndi Zacheis Souder. 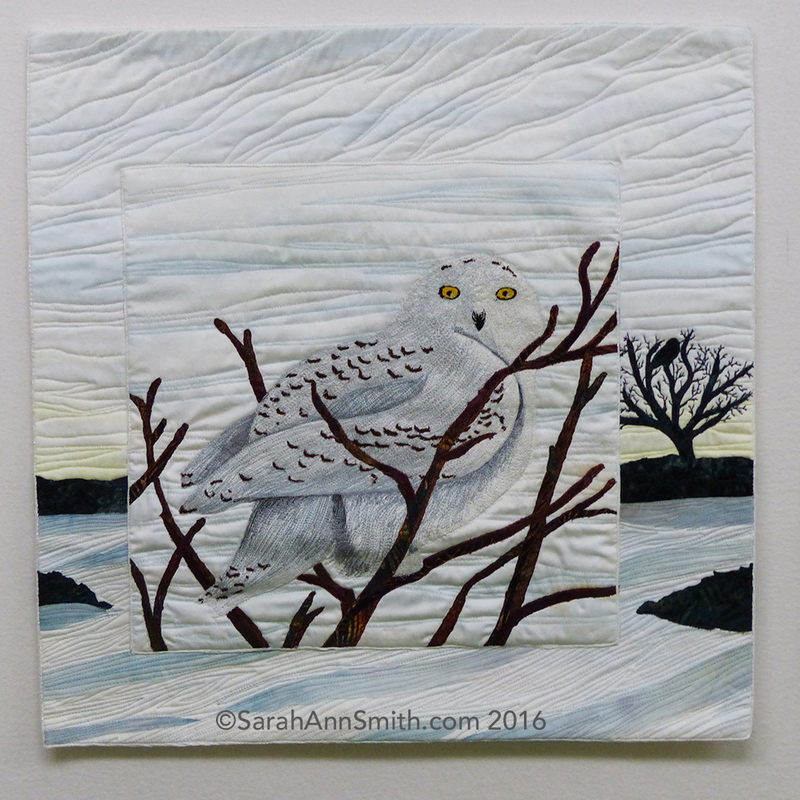 And the flora and fauna quilts for Acadia, including my snowy owl. They wisely edged the photo with a fine line of black so it wouldn’t “moosh” into the page! 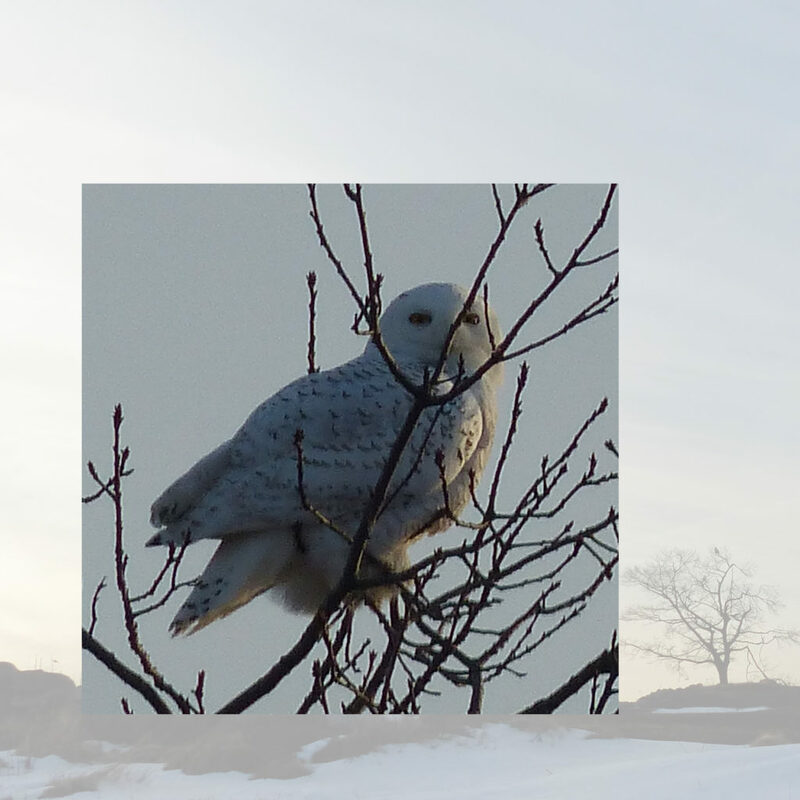 A couple years ago, there was an “irruption” of Snowy Owls, meaning they migrated a lot further south than usual, and were relatively easy to spot here in Maine. 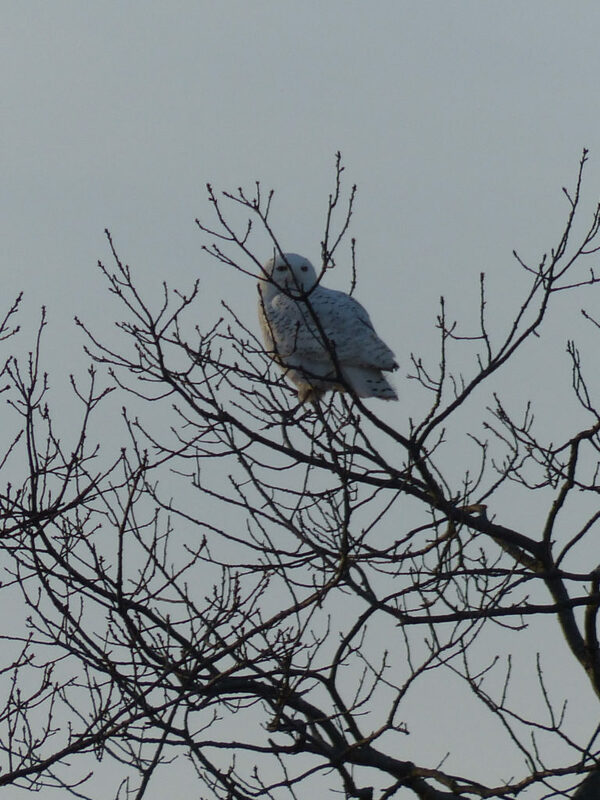 I added the Snowy Owl to my birder’s “life list” that winter. I went to Clarry Hill in Union, where two or three owls had been spotted. 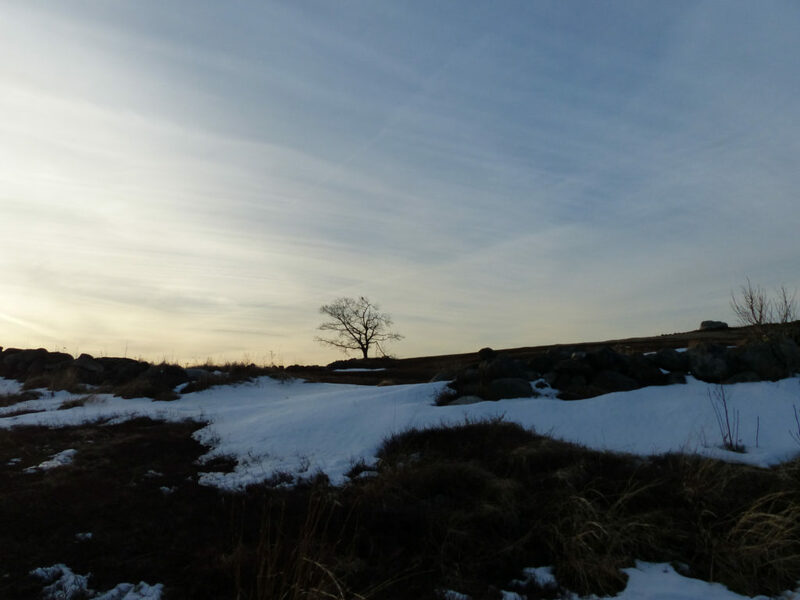 I walked along the path through the blueberry barrens on the bare hilltop, but nothing. As I was about to turn around, I spotted one at a great distance (beyond the no trespassing signs), so I was happy, but no good photos. Then I returned to the car. As I approached the car park, I turned and saw an owl in a tree growing next to a stone wall…camera OUT! Snap! Snap! Snap! Thank heavens for auto-focus. This was about 4 pm, as the sun was beginning to set. There was an owl in the tree on the ridgeline! The owl had followed me down the path and was checking me out! The owl few even closer, so I got some better images. I still get goosebumps looking at this photo! To hear the rustle of an owl’s wings and landing….wow! Hopefully, one of these days Sony will make an even longer focal length zoom for my a6000 mirrorless camera…I am saving already because it WILL be expensive, but worth it! I am inspired by Jeannie Sumjall Ajero’s nature photos she shares on Facebook. When it came time to make my quilt, I couldn’t decide which view. So I messed around in Photoshop, and thought, well why not BOTH? A composite photo image that was my guideline. I obviously adjusted the branches and the placement of the stone wall/tree in the final work. The subtle winter palette is challenging in terms of finding fabric, so I dyed some cotton sateen. Despite being stingy with the dye, my first attempt there was too much color, so I tried again and got just the pale tones I needed. I created the bird on white cloth, used stabilizer, and did the very heavy stitching on the bird first, then appliquéd her (probably a female because there is a lot of barring, the brown bits) to the smaller close-up image. I then composed the background quilt and appliqués the smaller one to the larger one. I’ll enjoy having her fly home eventually. Until then, if you get a chance to see this exhibit, DO! And no matter what, the book is a delightful volume. The **Library of Congress** has included the book in a display this year…how amazingly cool is that? Kudos to Donna and all the artists. Exceptionally well done! You can order the book on Amazon here. What a great thing to do on a long winter’s day!